Do you want a healthy marriage? It needs to be guided by a set of healthy habits. In this brand-new on-demand video conference, pastor, marriage counselor, and best-selling author Dr. Paul David Tripp will detail the healthy habits required for a beautiful marriage while identifying the toxic habits that need to be uprooted. 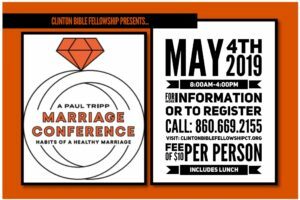 This conference is open to married couples looking to strengthen their current marriage, or single individuals preparing for a future marriage. Check-in and a continental breakfast will be available at 8:00AM. Session 1 will begin promptly at 9:00AM. No child care is available, but mothers of nursing infants are welcome.